This is a common question for everyone on well water wanting to use a home well water chlorinator. 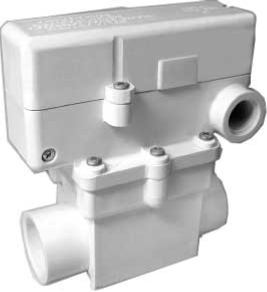 Metering pumps are used to inject a small amount of liquid chlorine bleach into the water, usually in conjunction with a contact tank. The pumps draw chlorine bleach from a solution tank and pump it into a pipe under pressure. Water used for drinking and cooking should be free of odor, slime-producing bacteria, and pathogenic (disease-causing) microorganisms that cause such illnesses as typhoid fever, dysentery, cholera, and gastroenteritis. Although several methods eliminate microorganisms and odors in water, chlorination is the most commonly used. Chlorination is effective against many pathogenic and non-pathogenic bacteria, but at normal dosage rates, it does not kill all viruses, cysts, or worms. 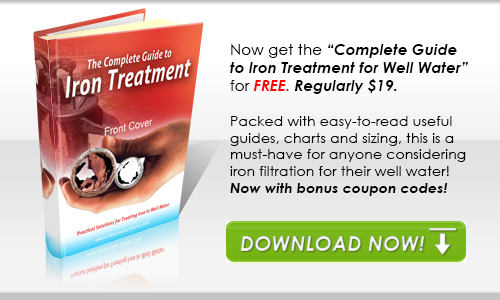 Often combined with filtration to remove the residual chlorine, it is an excellent and cost-effective way to disinfect drinking water supplies, eliminate odors, and oxidize iron, and other metals. 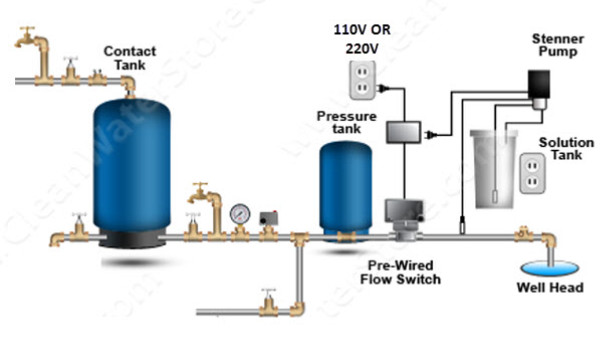 By Well Pressure Switch: In this type of installation, the metering pump is plugged into a dedicated electrical outlet that is wired into the pressure switch. When the pressure switch points close, the chlorine solution pump is turned on. This a reliable and low-cost option. An electrician may be needed to comply with local codes if you are unfamiliar with basic wiring. An easy alternative to installing a dedicated outlet and wiring to the pressure switch is to use a pre-wired flow switch. 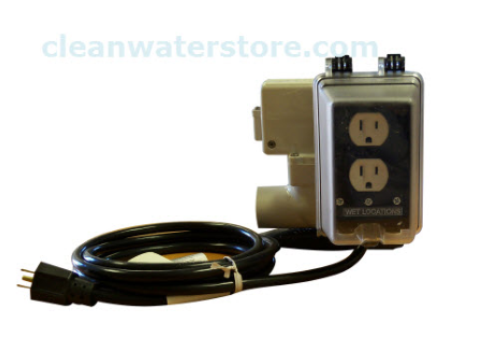 The flow switch cord is plugged into any 120V wall outlet, and the chlorinator pump is plugged into the outlet that is built into the flow switch. Whenever there is flow, the chlorinator pump is energized and starts to pump. Easy to wire, just plug in, turn on. Available in 110v or 220v. 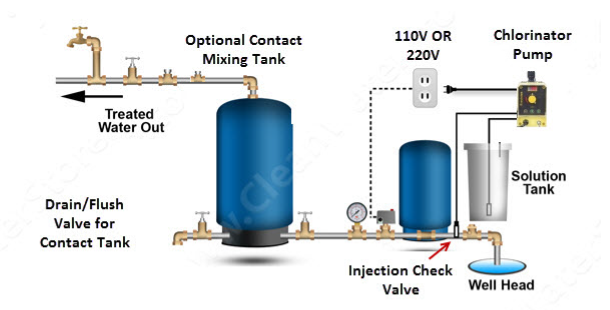 In some applications, the chlorine injection point must be after the pressure tank, such as when the pressure tank and well are away from the house and it is impractical to have the chlorine being injected before the pressure tank. In this case, a Proportional-Feed system can be used. Based on how fast the water is flowing, more or less chlorine is pumped into the water to maintain a precise residual. 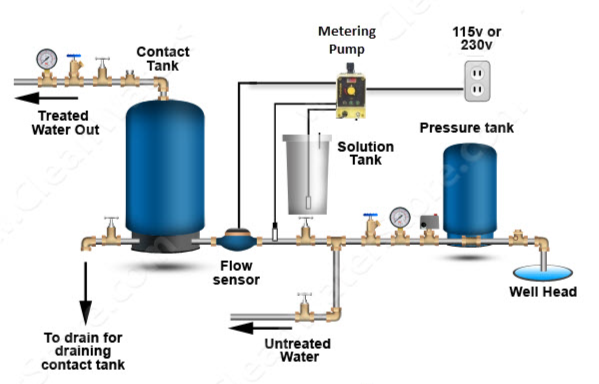 Like the flow switch, it is easy to install and allows installation of your chlorination system anywhere after the well pressure tank.